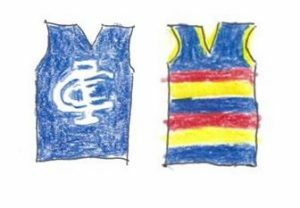 Round 23 – Carlton v Adelaide: At least we beat the traffic! Job done. Trip to airport completed. On the way home on the Tulla, the time had come to take the family to the footy. One of us barracked for Carlton and the other two were going for moral support. Tonight, I thought they had a chance in the Bryce Gibbs Cup. Adelaide came to Etihad on the back of a disappointing season, marred by controversy over the preseason camp and the disappointment of not making the finals. The Crows had lost the Texan, Taylor “Tex” Walker, Crows captain and forward line stalwart. No doubt too, injuries hadn’t helped either side for that matter. Many teams have been equally affected, but some have the depth to cope and others don’t. Unfortunately for Carlton, the game didn’t start well. By eight minutes into the first quarter, Josh Jenkins had kicked two goals. Was he the barometer for the Crows tonight? Watch out Carlton if so. A solid advantage was in place by quarter time and saw Adelaide lead by 4 goals. Plenty of time still for the Blues surely. The Crows had one late change. Rory Sloane, Adelaide’s vice-captain and master ball winner went out due to personal reasons and was replaced by Cam Ellis-Yolman, a midfielder still looking to create a permanent spot in the team. Adelaide is playing for pride and to salvage something for 2019. Unfortunately, Carlton’s season couldn’t end quickly enough. Patty Cripps was showing why he was seen by many to be the future captain. Harry McKay was showing he was up to the standard with some nice marks and goals. Charlie Curnow was down and out with a knee injury. His year ended an hour ahead of schedule, but he will be a shining light for years for Blues fans. Not that it mattered too much as the 8-goal lead at the half indicated a gulf between the two teams that wouldn’t be bridged in the 2nd half, barring divine intervention. My thoughts were simple. We could beat the traffic and get home ahead of the dispersing crowd of 17000. Was that being unfair? Had I compromised my moral support? Did it matter? My Carlton cohort surprisingly agreed and I hadn’t even verballed my thoughts. Maybe the lure of fortnite, the video game, held more appeal for him. He deserved a better showing by the Blues. Were there to be any improvement in the Carlton fortunes tonight, the radio call on the drive home would indicate and we could watch it from our lounge setting. Alas, it wasn’t to be. With Jenkins kicking 7 and youngster Jordan Gallucci 4, the Crows weren’t short of goals on the way to a 104pt win. Crows players jockeyed for 2019 contracts if they weren’t already signed up. Crows finish the season in solid fashion…twelve wins and ten losses. That sometimes has been enough to secure a finals berth. Just not this year. At least we beat the traffic. Marcus Holt on Tiger Woods: Sport’s Greatest Comeback? Colin Ritchie on Round 5 – North Melbourne v Essendon: A Very Good Friday. Peter_B on Almanac Soccer – Come On You Spurs! Glen! on Tiger Woods: Sport’s Greatest Comeback? JASON ANDREW TOPPIN on Almanac Soccer – Come On You Spurs!